Make sure you have a system with good performance (e.g. no other microstutter weak links). If you are using Windows 8.1, make sure you install the 1000Hz mouse fix. First, enable blur reduction strobing, such as LightBoost, ULMB, Turbo240 or BENQ Blur Reduction. Blur reduction makes microstutters easier to see. Strobing can make things more stuttery, so you need to raise your mouse Hz to compensate. This is where 500Hz vs 1000Hz can become noticed visually by human eye. Such as LightBoost 50% or less, BENQ Z-Series with Persistence set to less than 2.0ms. Next, find a window that has small text (preferably 6 or 8 point size). Drag window while trying to read text on it, drag smoothly at a speed that's approximately one screenwidth per second. That's a moderately fast drag. Make sure you have a really smooth mousepad, because you don't want microstutters from a bumpy/dirty mousepad. 1. Set mouse to 125Hz. Drag window left/right while reading text in window at same time. 2. Set mouse to 500Hz. Drag window left/right while reading text in window at same time. [i]Much smoother at ~1920 pixels/second, but there are rapid faint microstutters per second of ~4 pixel amplitude (1/500th of 1920). This makes it difficult to read tiny text being mouse-dragged, since 6-to-8 point text vibrates too much during dragging. 3. Set mouse to 1000Hz. Drag window left/right while reading text in window at same time. Even smoother at ~1920 pixels/second. The mouse microstutters are now nearly too faint to be seen, and small text is now readable while the window is being dragged on a good mousepad on a strobed(LightBoosted) 120Hz monitor at a dragspeed of one full screen width per second! compare reading dragged text when monitor is set to 100hz vs to 120hz. At 100hz, there is no microstutter at all. how much of an improvement is 500mouse@120hz to 1000mouse@120hz versus 500/1000mouse@100hz? 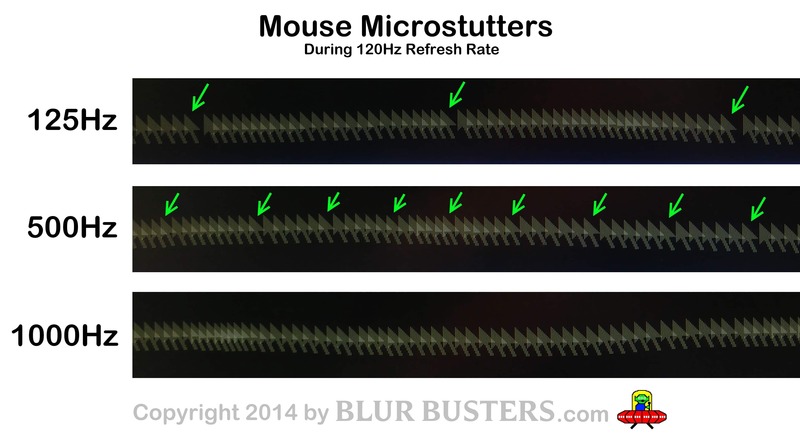 Chief Blur Buster wrote: Strobing can make things more stuttery, so you need to raise your mouse Hz to compensate. uh compensate?? with or without strobing, mouse hz should be always set to the maximum possible stable value. flood wrote: uh compensate?? with or without strobing, mouse hz should be always set to the maximum possible stable value. Many pro competitive gamers swear by 500Hz for better accuracy (see Comments section of Blur Busters Mouse Guide), because it feels better than 1000Hz with less mouse filtering behaviors. 1000Hz often pushed the limits of mice and computer systems and often had some distortions of various kinds (including filtering built into the mouse itself that interfered with a finely-honed pro gamer's aiming). However, with modern computers, 1000Hz is pretty stable but most people could not tell apart 500Hz vs 1000Hz on 60Hz monitor. However, with 120Hz, and especially with strobing, the lack of motion blur makes it easier to actually see 500Hz mouse vs 1000Hz mouse. The pros of 1000Hz then outweighs the cons, especially if some of us (like me) can see the fluidity difference in window dragging and FPS gaming mouse-flicks. Of course, if you're not using blur reduction (strobing/LightBoost) or GSYNC, 500Hz vs 1000Hz becomes less important since the difference is far more subtle (the minor mouse microstutter difference of 500Hz vs 1000Hz completely lost in the motion blurring and/or VSYNC OFF microstuttering). a.k.a. Beat frequency effects between the Hz of the mouse and the Hz of the monitor. EDIT -- confirmed -- I've photographically proved that my microstutter math is correct (via gaps in mouse dropping effect during long exposure). Photographs being posted this weekend, either as a forum post, or possibly in a new Blur Busters article. Chief Blur Buster wrote: If you are using Windows 8.1, make sure you install the 1000Hz mouse fix. Thanks a lot for that! Why must MS always mess things up?! flood wrote: compare reading dragged text when monitor is set to 100hz vs to 120hz. At 100hz, there is no microstutter at all. True. However, when you turn VSYNC OFF, you're no longer running at 100fps, so the mouse microstutters come back when the mouse pollrate is out-of-sync with the framerate. There can be complex 3-way beat frequency effects between mouse Hz and framerate and display refreshrate when all 3 are out of sync with each other, creating a lot of microstutter harmonics, on top of the game engine's natural fluctuations. For the simplicity of this thread, I am making the assumption framerate == refreshrate (VSYNC ON or fps_max equalling refresh) and ultrafluid motion (e.g. window dragging or old game engines like Source) so that we're mainly focussing on the microstutter mathematics (beat frequency effects) between refreshrate and mouse pollrate. Photographic proof that my microstutter math is correct. Long camera exposure (1second) while the mouse arrow moves past. For practical purposes, I had to limit to a mouse movement of 960 pixels/second (approximate, via chasing a TestUFO motion object with my hand on a nearby black window). Photographic proof of my microstutter math! Sometimes the timing of the microstutters aliases back and forth (e.g. gapping every 24 to 26 positions and some occasional outliers, rather than exactly 25 every time) due to other timing imprecisions, but the microstutter definitely averages these numbers. And I can definitively confirm it is easier to see in real life than in these photos, for certain cases (120fps VSYNC ON, or GSYNC, or ultrahigh framerate VSYNC OFF where framerate is high enough to avoid big harmonics), for the situation of left/right turning in FPS games on recent cards in older engines (Source, etc) during 120Hz+strobing (LightBoost) than in this photographic capture. It definitely isn't detectable at 60Hz. And hard to see regular 120Hz. But once you do strobed(LightBoosted) 120Hz, the 500Hz vs 1000Hz pollrate actually becomes visually noticeable especially at ~1920pixels/second. Precision controlled refresh timings (e.g. GSYNC) can also make mouse Hz harmonics visible. Mouse 500Hz vs 1000Hz is confirmed (on my system) the biggest source of microstutters during solo gaming Source Engine double-buffered VSYNC ON 120fps on a GeForce GTX 600series/700series/Titan on a strobed 120Hz monitor. Some of us like VSYNC ON double buffered to get perfect stutterfree motion in older engines during our solo games when lag isn't important. We have finally reached a technological point where 2000Hz mice will actually soon make a human visible difference, especially when we go to strobed 240Hz (OLED rolling scan). At that point, USB timing jitter is a weak link, but there are workarounds with special USB techniques to get that required precision, and bypassing USB hubs. TL;DR: Consider using a 1000Hz mouse poll rate if using a 120Hz+ monitor at high frame rates, especially if using strobing (LightBoost) or GSYNC. If I am only using USB 2.0 port for my mouse, should I use 500hz or 1000hz polling rate?